The Hayden Library (in MIT’s Building 14) is hosting an interactive exhibition starting on September 7th. Visitors to the second floor will be able to play four videogames that are adapted from literary works, from Sophocles and Shakespeare to F. Scott Fitzgerald and Douglas Adams. The exhibit explores the range of approaches taken to create video games of literary works, The result is often whimsical, turning the worlds of these stories into spaces to be explored, often transforming them according video game conventions. The games featured in the exhibit invite players to become Nick Carraway, the narrator of The Great Gatsby, dodging drunken partygoers in his way to meet Gatsby; explore the world of Shakespeare’s plays; carry out an exercise of introspection based on Sophocles’ Oedipus at Colonus; or revisit the events of The Hitchhiker’s Guide to the Galaxy. The exhibit is sponsored by the De Florez Fund for Humor, the MIT Council of the Arts, the MIT Game Lab, the Electronic Literature Organization, and Comparative Media Studies. Is it the original 1984 Steve Meretzky Hitchhiker’s game? 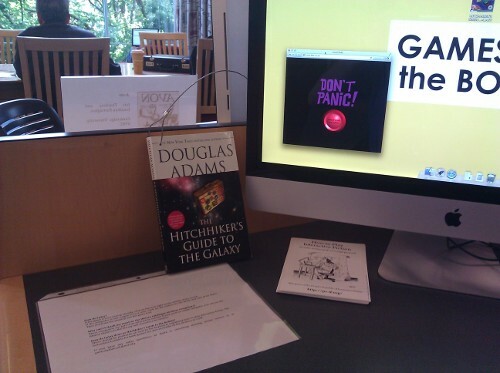 The Hitchhiker’s Guide to the Galaxy, published by Infocom in 1984, is a collaboration between Steve Meretzky and Douglas Adams. It is the game in the exhibit, but we have provided the illustrated 20th Anniversary Edition, which won a BAFTA award in 2005. This edition of the 1984 Infocom game was created by Sean Sollé (technical director), Roger Philbrick (project producer) and Rod Lord (designer and illustrator). 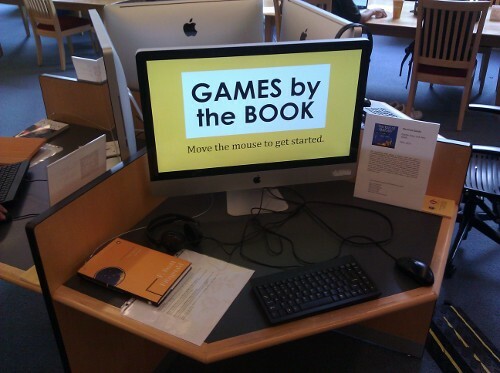 The toast-based “Slice of MIT” section of Infinite Connection, the MIT Alumni site, recently featured the Games by the Book exhibit.